Although previous issue more low end mobile phone class, Motorola fact remains the same attention to business. Evidence, a series smartphone vendor America are right this. The selected name is MotoQ. Like family "MotoQ" other smartphone operating systems that have Microsoft Windows Mobile 6.1 Standard is also to bring the design width, the structure of the QWERTY keyboard. This is related to its main function as a mobile business that the ease of access to office facilities. For example, text messages, email and the standard features of Windows Office. Unlike his senior, MotoQ 11 has some new abilities. There is a WiFi can be used for high-speed internet connection and stable. Media also support this connection with the Boingo Mobile, which can automatically to connecting MotoQ 11 to hundreds of locations in the WiFi all over the world. Your hobby is traveling also pampered with dish technology GPS / A-GPS. Meanwhile, the software for digital maps can use Google Maps. 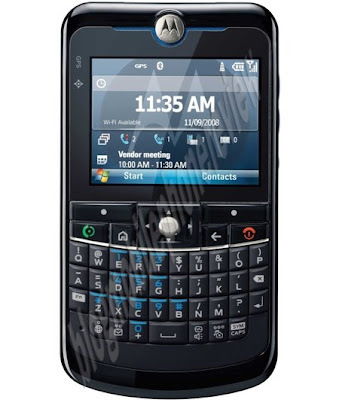 In the entertainment, MotoQ 11 have also set up a media player and 3.2 megapixel camera plus strength lights flash and the ability to record 15 fps video speed.